It is many years since I have lived in a town, so while I have long appreciated the Transition Town movement in principle, I have not had the chance to get involved. Since I started teaching in Totnes, the town where this global movement was born, I have taken the opportunity to explore what transition means in practice. Last night in the Civic Hall, Transition Town Totnes (TTT) held an event to showcase the many projects that are active in and around Totnes. And there are many. I was enthralled by the long stream of speakers talking about what they do in the community, and the invitation to get involved. Every corner of society is met with positive, citizen-led solutions to creating a more sustainable and resilient culture. Like the permaculture movement as a whole, Transition now embraces every facet of our human experience, from personal well-being, arts and social care, to local organic food, upcycling, housing and economics. Last night the journey of the movement was beautifully and comically acted out through the story of a metaphoric seed being sown. The metaphor has some serious mileage when you consider how the movement has grown since it’s conception in 2006. Co-founder of the movement Rob Hopkins finished the evening with the launch of his new book, 21 Transition Stories which takes inspiring examples of Transition projects from around the world. Rob’s eloquence as a speaker has played no small part in spreading the idea of Transition, and it must be more than a little gratifying to see just how far and wide the seeds have travelled. These stories were taken to COP21 in Paris in November to demonstrate the power of positive community action. It is worth reminding the Totnes community that they are a flagship for community action, and Rob Hopkins did so by sharing some of these international stories in his speech. 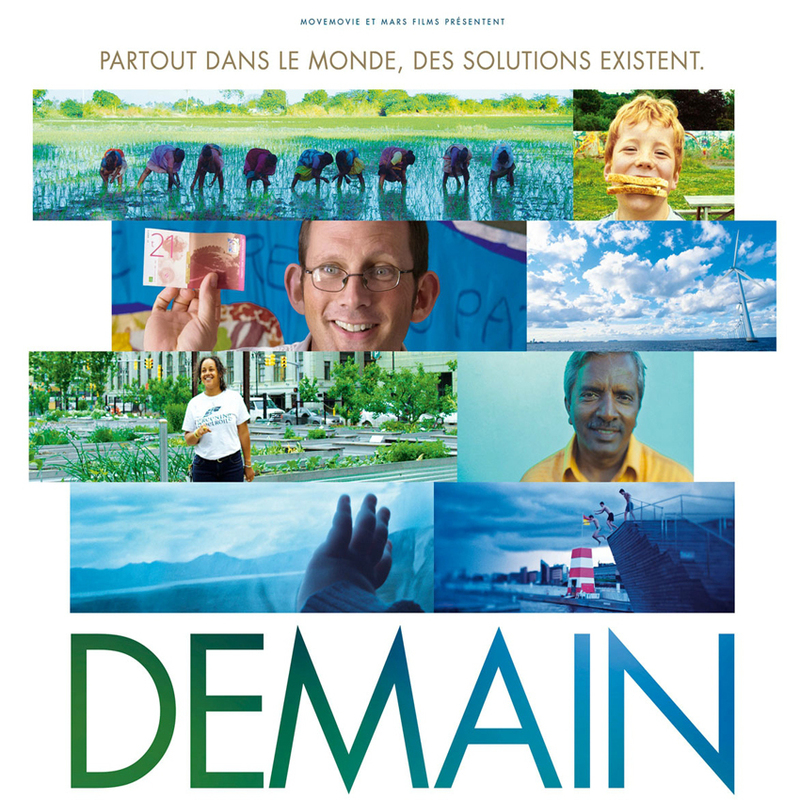 The Totnes story is featured in the French film Demain, in which directors “Cyril Dion and Mélanie Laurent decided to [line] up known solutions [to today’s problems] in all spheres side-by-side to show what our society could look like tomorrow…” As a species we are pretty sure that we are intelligent and creative beings, but our current predicament would suggest otherwise. It is time to remind all of humankind how intelligent and creative we can be; this is what Demain does so beautifully. 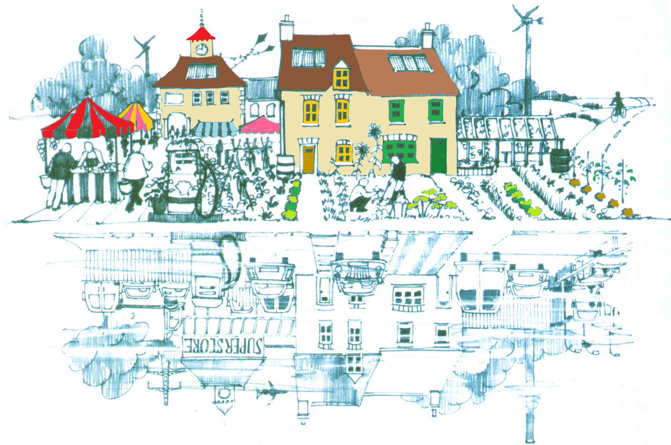 Many ideas which were born in Totnes, or made a success here have been adopted in towns far and wide, because ‘if it works there it could work here.’ This reminds me that the most powerful impact we can have is to walk our talk and live by our values. Permaculture is all about positive solutions, found and implemented at a grass-roots level, and Transition is an urban manifestation of that principle. I sense a reinvention of the word activism – we can reclaim it to mean ‘positive action’ rather than meeting negative actions with negative actions. This may look like small steps on an individual level, but when we add up all of those small steps we see something moving pretty fast- there is no better example of this than Transition. For more information about TTT projects go to www.transitiontowntotnes.org/ and for information about the transition network as a whole go to www.transitionnetwork.org where there is also an excellent blog.